Why get certified with NSTPA? We’ve created the first online sunless training system from the ground up. We feature the only online searchable database for licensed certified technicians that complete the NSTPA program. Unique License # assigned to your name, and your name only. Your customer’s will be able to verify your certification easily by your first/last name, or business name. Certified technicians show a 89% higher success rate over businesses that do not get certified. Stick out from the rest of the competition! Being certified gives you marketing power and instant trust with customers. You can purchase a pocket card that features your profile picture, name, date of certification, along with a scan bar code that holds your license number and information. Add for only $25.00! You have the option of purchasing a printed training guide if you prefer to read the training/certification via printed instead of online. We understand some people study better on paper than reading digitally. Add this product for only $50.00 on top of your certification purchase. 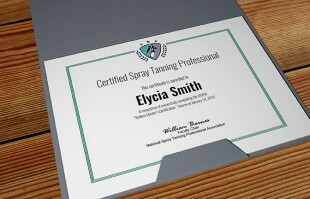 Looking to display a college grade certificate on your salon wall or place of business? We have this available as an add on purchase. The cost covers the basic material and shipping to your location. Why invest in sunless tanning? Sunless tanning has quickly become one of the most popular sectors within the health and beauty industry. For indoor tanning salons and spas, it has provided a new income stream which includes some of the highest return on investments ever seen within the industry. What type of return are we talking about? How about over 1,200% return! The good news is, some salons notice an even higher return on their investment. Sunless tanning is growing and only expected to go higher! You may be wondering if the sunless tanning industry still has more growth potential after its recent surge. Well, lets just say that it is growing fast enough to get the attention of CNN Money and some other major news outlets. This potential growth can only mean continued business and growth for sunless tanning technicians, salons, spa’s and mobile tanners everywhere. Realizing the growth potential for manufactures will only in turn mean continued growth for the end user; sunless tanning technicians. With a return on investment of well over 1,000%, this is an opportunity that you can’t miss! As the popularity of sunless tanning has continually expanded, so has the need for sunless tanning technicians. We have seen many different types of businesses add sunless spray tanning to their list of services, including but not limited to: estheticians, cosmetologist, medical spas, salons, nail salons, mobile salons/spas, and more! From this expanding market we have seen a new business spin-off – mobile tanning. How many sprays can a sunless tanning company perform each month? This is a common question we see when entrepreneurs like yourself are considering adding or getting into the sunless tanning business. On average, a spray tan session takes 15 to 20 minutes, but for the sake of argument we will use 20 minutes per session. If you plan on working only 4 Hours a day, that means you are able to easily offer 12 Spray Tans a day if you book the tans back to back in a salon based situation. If you are mobile tanner, you have to add drive time, meaning 4 hours of work including driving equals to about 8 tans per day. Salons performing 12 sprays per day times 28 month calendar = 336 Tans per month average. (Very conservative number) most well established salons can perform 30 tans per day per technician, or 840 tans per month per technician. Mobile Tanning businesses performing 8 sprays per day times 28 month calendar = 224 Tans per month average. (Very conservative number). Is 2017 a good year to get into Sunless Tanning? If you have turned on TV this past couple of months heading into 2017, You’ll see on the news that the FDA is preparing new laws that will be banning tanning beds for anyone under the age of 18, regardless of the parents approval in ALL 50 States. This will be an instant burst of business for the sunless industry as a whole. Are you too late? absolutely not, the new tanning laws will not go into effect until the middle or end of 2017. This gives you plenty of time to be trained, certified, and building your business heading into possibly the “biggest” boom the Sunless industry has ever seen. If you are a current tanning salon offering tanning beds, this is the time to prepare for a loss of business you’ll see once your 18 and under crowd is no longer to use your tanning beds. It is more important now than ever to add SUNLESS tanning to your list of services to grab the sunless market in your area before your competitors do. Current Tanners 17 years old and under spend over $650 Million dollars annually(and growing) on tanning bed memberships and tanning lotions . Once the new law goes into place, that entire market that is 17 years old and under will instantly be required to fill the void of tanning beds, which the only real solution is SPRAY TANNING! Are you going to grab your piece of the $650 Million Dollar revenue stream up for grabs? Signup for the world’s #1 Online Certification Course.